Warren Buffett has called himself "85% Graham and 15% Fisher". While the works of Graham are often cited, Fisher's book "Common Stocks and Uncommon Profits" is not. Here follows a summary of the expanded version of this book, which includes 2 other works by Fisher including "Conservative Investors Sleep Well" and "Developing an Investment Philosophy". A conservative investment must be the lowest-cost producer in a majority of its product lines, and must appear able to continue to do so in the future. Its margins must be such that if business conditions worsen, its competitors will go out of business, allowing it to take share and profit in such a situation. Note, however, that in a bullish period, such conservative companies will not see their stocks rise as much as their competition, a situation best illustrated by example: if two companies competing in the same industry both see their revenues rise (with costs staying flat), the company with the lower margins will see a much higher percentage growth in earnings. Companies must be constantly alert to changing customer needs. What is desired today is not the same thing as what was desired yesterday, but many companies fail to utilize this distinction. Being able to explain the advantages of one's products/services in terms the customer understands is a key success factor in maximizing profit and maintaining and growing business. Being the low-cost producer but with a weak marketing team is akin to having a powerful engine with a loose pulley belt that is therefore only producing a fraction of the results it would otherwise attain. This area is not limited to companies engaged in high-tech industries. Today, all companies should be constantly innovating in order to improve existing product lines or open new ones. This requires not only technical competence and ingenuity, but also the teamwork and leadership necessary for people with different expertise to combine their efforts in creating products/services that add value. Companies with above-average financial skill are at a great advantage. Being able to tell how much a product is costing (which is often difficult to do when overhead is spread across many product lines) can avert disaster, improve returns on capital, and give the company clues as to where it should make investments. Considering that a conservative investment is meant to conserve capital, why all this talk of growth, increasing profits, and continued development? Companies that fail to go uphill end up going downhill; technological innovation, along with changing habits and customs have resulted in an ever-increasing rate which even the oldest industries are changing. Companies must stay up-to-date or they will not conserve the investor's capital. In most of the letters Fisher receives, the public asks him how he goes about finding stocks that are worth investigation. As a result, in this the final chapter, Fisher discusses where his investment ideas come from. Previously, Fisher used to believe that the best source for investment ideas came from his executive contacts. However, after doing a quick study, Fisher now realizes that only 1/5 of the ideas that he fully investigated and only 1/6 of his total investments came from this source. The rest of his ideas have mostly come from hearing about the investments of other investors whom Fisher respects. Very rarely will Fisher find ideas in the print media. Once a company has been uncovered that is worth further investigation, Fisher applies the scuttlebutt method as discussed in Chapter 3. Fisher stresses that it is of the utmost importance to investigate the company in this manner before meeting with management. Since an investor will not get a useful reply, no matter how candid is the management, to the question "Is there anything else I should know about your company? ", the investor must know what questions to ask about the company's weaknesses beforehand. Good managements will often speak candidly if the investor shows he has done his research and has judged the company well. Fisher also argues that it is important to meet the key decision makers, but because the demands on the time of these people are so high, companies will only let investors who they feel are competent take up the time of these valued managers. Therefore, having done the research as per the previous paragraph, investors must approach management in a manner that makes them believe the investor is competent. An investor who shows up at the door unannounced, for example, is likely to meet a member of the investor relations department rather than a key decision maker. An introduction through the company's commercial bank, investment bank, or important customers or suppliers is a great way for the investor to ensure he will meet the right people. Boss Holdings (BSHI) is a company that makes work gloves and other protective wear. Though currently profitable, management has decided that the expenses resulting from listing on an exchange are not worth the benefits. As a result, it has decided to de-list the company and take it private. Normally, this would serve to reduce the value of the outstanding shares, since there will no longer be a liquid market for shareholders to dispose of their shares once the company goes private. But for small shareholders, an immediate profit situation has arisen. The company plans to de-list if it has fewer than 300 shareholders. And since management appears to want to reduce the number of shareholders to that level, it is trying to shake out small shareholders by offering a cash incentive which is higher than the current share price: every shareholder who owns less than 100 shares will receive $7.65 for each of their shares - but the stock trades for just $6 at the time of writing (though it does bounce around)! The deregistration will be accomplished by a reverse 1:100 stock split of the Company’s common shares. All shareholders owning fewer than 100 shares prior to the reverse stock split would be cashed out by the Company at a price of $7.65 per pre-split share. The reverse split will be followed immediately by a 100:1 forward split of the Company’s common shares, which will return all shareholders owning more than 100 shares to the same number of shares they owned prior to the reverse and forward split transactions. If, after completion of the reverse and forward stock splits, the Company has fewer than 300 shareholders of record, the Company intends to terminate the registration of its common stock under the Securities Exchange Act of 1934, as amended. If that occurs, the Company will be relieved of its requirements to comply with the Sarbanes-Oxley Act of 2002 and to file periodic reports with the SEC, including annual reports on Form 10-K and quarterly reports on Form 10-Q. Shareholders still have to vote to ratify the matter, however, the company is controlled by its managers, so the vote is not likely to fail. Assuming a shareholder could buy 99 shares for $6, a $163 profit minus transaction costs is there for the taking. (I say "assuming" because the stock is not very liquid. Nevertheless, the recent trading pattern of the stock suggests this is possible.) For most investors, such a move may not be worth the effort, but for others, the possibility of a 27% return exists if the "small shareholder buyout" takes place within a year. Key Tronic (KTCC) is a company that has come up a few times on this site, and has been a member of the Stock Ideas page for quite a while. A few months ago, it traded at a discount to its net current assets despite being a profitable company. Two months ago, it was discussed as a stock that could only go up, due to the fact that downside risks were minimal compared to upside potential. Yesterday, investors hit pay dirt, as the stock showed a 20+% increase over the previous day's close following the company's quarterly results. This brings the stock's return to almost 400% over the last year. In a relatively short period of time, the stock went from a Ben Graham net-net to trading at a premium to its book value, meriting placement on the Value In Action page. Could investors have foreseen the fact that the company would beat earnings estimates by 5 cents per share, which would subsequently blast the share price to a level not seen since mid-2007? Possibly, but that's not how value investors make money. When the share price would rise and under what circumstances was not really known. What was apparent here is that the market was not properly valuing the company. First, investors were offered the opportunity to purchase the company's inventory and accounts receivable at a discount, with the rest of the company's assets thrown in for free. But this was not a company bleeding cash, either. The company had been profitable for 22 consecutive quarters! Furthermore, future earnings were not subject to US taxes, as discussed here. Finally, the company had a flexible cost structure, allowing it to scale down expenses should revenues decline. Learning about value investments of the past can help the investor uncover what might be today's value investments. Key Tronic shows us that even stocks that trade with what appear to be high P/E ratios can still be extremely undervalued! After allocating depreciation, store operating costs, and SG&A expenses towards the minimal gas profits that exist, gas operations likely lose money for the company. Clearly, the company's business model is to lure in customers with a competitive gas price, and then get them to buy cigarettes (which represent 35% of convenience store sales). Counter-intuitively, this type of business actually makes more money when gas prices decline! As a result of The Pantry's stable operating model, the company has been able to load up on debt. (For a discussion on why this is so, see here.) But its debt load is now of epic proportion: tangible equity is negative, and debt to equity levels near 80% when operating leases are taken into account. Nevertheless, the company generates positive cash flow, and appears focused on reducing its debt. As such, the potential for price appreciation is strong. At the same time, however, because of the high debt levels, there isn't a lot of room for error for the reasons discussed here, and therefore investors should tread carefully. 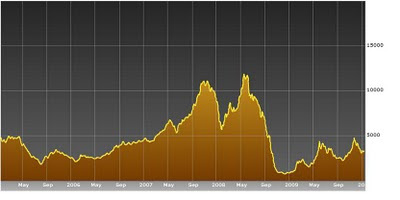 Those interested in finding undervalued stocks among shipping companies, a beaten-down industry (with good reason, as discussed here) will have come across the Baltic Dry Index (BDI), an important measure with which many shipping stocks are somewhat correlated. However, this index operates completely differently than most indexes with which investors are used to working, and therefore an understanding of how it works is imperative in applying its usefulness to making investment decisions. Though well off its highs of the last couple of years, the BDI has recovered to 2006 levels, suggesting shipping companies should be able to make money, right? For now, perhaps, but the future does not look great. You see, unlike most indexes we're used to working with, the price of the BDI is not set by the supply and demand of investors, which would make it a forward looking index. Instead, the price is based on the spot (current) supply and demand to ship dry raw materials. There is no element of speculation; the index price represents a composite of what it costs to ship these goods right now over a number of important routes. As those ships continue to add to the supply of existing ships (and they will until 2012), they will put downward pressure on the BDI. The BDI can be a very useful tool for analyzing the state of affairs for dry bulk shipping companies. Care must be taken, however, in understanding how the index works so that investors make informed decisions when it comes to purchasing shipping stocks. Of course, this is only the supply side of the equation. 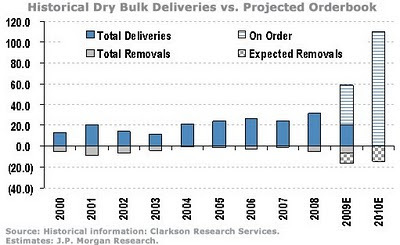 We'll leave the discussion of dry-bulk demand for a future post. The benefits of diversification are overstressed, in Fisher's opinion. However, the drawbacks are not. Fisher recommends that the investor know his companies well, and having too many companies can prevent this from occurring. Large companies operating in several business lines are already diversified, and therefore if a portfolio is made up of only these types of businesses, where no product lines between the companies overlap, Fisher recommends investors need only 5 stocks to be diversified. At the other end of the spectrum, if the investor has a portfolio of only small stocks in single product lines, Fisher recommends putting no more than 5% of one's portfolio in any one stock. The threat of war causes investors to ignore fundamental economics in forming their stock quotations. As such, investors should take advantage of such opportunities in order to buy stocks during these temporary dips. Investors will frequently be influenced by a company's past share price, and its past P/E ratio, and make assumptions about the company's future valuation based on the past. Fisher argues that past valuation levels are not relevant, and the investor should always be forward looking in order to determine what a company is worth. Fisher admits that the practice he recommends in this section may be controversial, but he believes timing, and not just price, should be used when purchasing a stock that is trading at a rich value. If a stock passes the 15 tests of Chapter 3, it may be at a price that, while not unattractive, commands quite a premium to the market. Fisher suggests that in this case the investor wait in order to buy at a later date. This is not easy for the investor, since we are all influenced by the world around us. However, Fisher urges the investor to see through the waves of optimism and pessimism that take turns over the market and over specific industries. These waves will inflate and deflate P/E ratios, offering investors opportunities for profit. The temptation is there to buy brand new companies with little operating history, since investors who wait for these companies to become established will have to pay several times the price. Fisher argues that there are too many potential points of weakness for companies without a few years of sales and without at least one full year of operating profits. 2) Don't ignore a stock just because it is "over the counter"
Fisher argues that the rules for over-the-counter stocks are not too different from those on the exchange. If a great company can be found, the investor should not disregard it simply because it is not traded on an exchange. A company's annual report can appear upbeat simply because of the skill of its investor relations group. Investors are encouraged to see the facts that are often hidden between the colourful pictures and rosy language. When reports fail to give information on matters of real significance to the investor, the stock should not be considered for investment. In some cases, a stock may trade for twice the P/E of the market because earnings are expected to increase relative to the market. In such a case, analysts will often say the stock price discounts the future earnings growth. Fisher cautions the investor from this line of thinking. Because the investor is seeking out companies (as per Chapter 3) that continue to bring new products to market or find new markets for products, these companies should continue to grow. 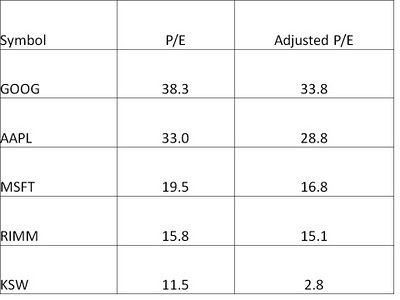 As such, there is no reason why these companies should always have a P/E that is much higher than the average company. In some cases, investors will be unwilling to pay the market's asking price, and will therefore issue limit orders. In order to save a few bucks, the investor may cost himself dearly over the long term. If a company is a great company suitable as a long-term holding, the potential gains far outweigh the few dollars potentially saved by holding out for a better price. It is best not to take the chance that the issue will never be purchased. We've discussed how looking at the amount of margin debt in the market can be used as a contrarian strategy: if margin debt is high, investors are optimistic, while if margin debt is low, pessimism is likely rampant, suggesting a buying opportunity may exist. But margin debt data is best applied to the market, whereas most investors are interested in individual stocks. Furthermore, margin debt data comes out a couple of months after the fact; since it can change very quickly, this data then becomes stale. There is a useful contrarian indicator that takes care of those two problems, however (though it may introduce a few more as well). While value investors are known for perusing 52-week low lists in search of stocks that are out of favour, another way to measure the least popular stocks is by their short interest. If many investors have sold a company short, it shows 2 things. First, the market holds a lot of pessimism for this stock, and second, the shares sold short will have to be bought back at some point, indicating a potential bounce for the stock. Signet Jewelers is a retail jeweler in the US and the UK. It looks like a tremendous bargain - until you uncover the facts! The company trades for $28/share, but has $16/share of cash, trades at a P/B of .14, and generates revenue of $376/share! So what's not to like about this company? Well, all of the above numbers are wrong, apart from the share price. But these are the numbers that Yahoo! Finance and other sites display for this company. It would appear that one misplaced decimal point, concerning the number of the company's shares outstanding, changes this company from a large-cap into a deep-value small cap! While we've previously discussed the need for investors to look behind the numbers, it should also be stressed that investors should look at the numbers as well. We've seen before how Google Finance makes both one-off as well as systematic errors, demonstrating the need for investors to verify any data that stock sites provide. Yesterday, it was announced that shareholders in Japan Airlines (JAL) would be wiped out, as the company would undergo a restructuring that would see creditors and the Japanese government own the beleaguered airline. Obviously, the immediate problem was that the billions of dollars of the company's losses prevented the company from paying back the billions of dollars of the company's debt. But more fundamental than this is the plague that afflicts the entire airline industry, and always has. 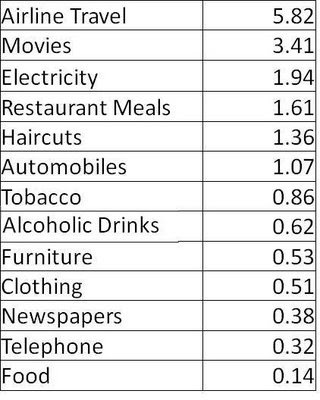 Basically the chart is telling us that for every one percent drop in income, we see a drop in demand for each of these items corresponding to it's chart entry. For example, at the bottom of the list, we see that for every 1% drop in income, food demand drops by just .14%. On the other hand, at the top of the list, we see that airlines are disproproportionately affected, with demand dropping by 6% despite only a 1% fall in income! The evidence? Consider that this is the fourth government bailout of JAL since 2001! Moreover, consider this list of bankrupt US airlines since 1979. In most industries, a list of the companies that have gone bankrupt will contain a lot of fringe companies with the occasional fallen angel. In the case of this industry, however, the list reads as a who's who of airlines! In his book, Mohnish Pabrai has discussed the cyclicality of shipping stocks, and how they might offer investors opportunities when times are tough. Last time we looked at this industry, however, it was in disarray. Companies had made purchase commitments for new ships, and so supply was going up, but demand had fallen drastically. Has anything changed in the last several months? The demand situation appears to have stabilized to some extent, with the Baltic Dry Index showing some increases from its lows. Unfortunately, many ordered ships are still on the way, as shipping companies loaded up on debt to order ships when times were good. Value investors will often look to beaten down industries to find babies that have been thrown out with the bath water, and the shipping industry is certainly beaten down. Are there any gems to be found? Perhaps there are companies that didn't order a "boatload" of new ships, and therefore represent safe investments that can be had at a fraction of their long-term value? The ones that look appealing at first glance are TBSI, ESEA and SBLK. Of course, this is only a first look at these companies, and digging much further into these companies would be necessary before making an investment. 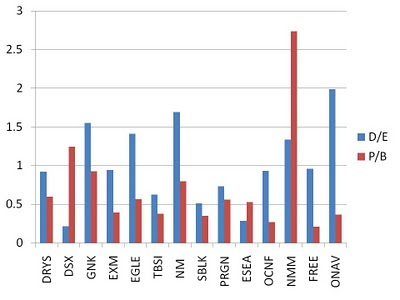 For example, this chart tells us nothing of the future commitments of these companies; if they have promised away large amounts of capital for new ships, the economic picture for these companies is not so bright (something we'll examine in a future post). It's important to note that there are some other major differences between the companies that the chart doesn't recognize. For one thing, book value is an imperfect measure of a shipping company's fleet. The value of ships purchased will have changed depending on the type of ship and the time of purchase, and so fleets may not be comparable across companies on just their book values. Furthermore, some companies specialize in some commodities, and some companies operate in the spot market while other sign longer term contracts. Nevertheless, a screen such as this can be a good starting point in determining which companies are worth a closer look. While not as dramatic as before, clearly the trend is still up over the last few years, with the average store's inventory having risen some 60% since 2005. While the recent trend is still up, the situation does not look as dire as it did initially. Unfortunately, however, it is very difficult to draw any reasonable conclusions from this data. Since the company doesn't break down its inventory by type, it's difficult to determine if there is a build-up in one type of product (say, used games, as the reader was suggesting). Furthermore, the company is constantly dealing with changing product demands from consumers: hardware sales were all the rage when new consoles came out, but as major new consoles aren't slated to come out for several years, a greater percentage of sales will now be of the software kind, which come with different inventory constraints and challenges. The reason for the jump in inventory compared to last year was attributed to the fact that the company loaded up on a single game title, Call of Duty: Modern Warfare 2. Avoiding stock outs is a key success factor in driving new software sales, as the company blamed stock outs of three key products as one of the factors that caused its lower than expected December sales. Finally, the company does have certain protection from its vendors from obsolescence. As an important distributor in the video game market (which will likely be the case until such time as game downloads gain traction), GameStop has been able to negotiate return privileges with its major suppliers should it be unable to sell product. Of course, this would likely only apply to new products. Determining the inventory situation at GameStop isn't easy. The company's unique challenge of a constantly changing product mix, along with the fact that it doesn't disclose inventory by segment, forces the shareholder to have to speculate somewhat as to what's going on. (Some companies make it easier to value inventory, while other companies don't.) Fortunately, the Christmas period is now over, and shareholders will soon get a look at how well the company sold through the large inventory levels it took into the holiday season. In this chapter, Fisher discusses whether dividends are important in stock selection. Fisher believes the public's thinking to be a little twisted and contain a number of half-truths when confronting the topic of dividends. If managements are building up excess liquidity or generate sub-optimal returns on investment, Fisher absolutely believes that shareholders are better off if dividends are paid. However, the focus of the book has been on investing in the type of company that is generating excellent returns and with competent management; therefore, for the companies under consideration, these would not be issues. Continuing with the assumption that this discussion is meant for holders of stocks which pass the 15 items listed in Chapter 3, for investors who are currently net buyers of common stock, Fisher finds it bewildering that they would find the idea of a dividend appealing. Presumably, they have invested in a great company, so it is strange that they would be willing to pay a tax, and then re-invest the lower proceeds, whether with the same company or elsewhere. Even pension funds, who do not pay tax, have to pay for the effort and transaction costs of investing the proceeds, when the funds could be utilized by the company with high rates of return. Fisher recommends that management pay out a percentage of earnings, and stick to that, slowly and consistently raising it as earnings increase. In that way, they will attract the investors that are interested in that dividend rate and who can count on the income they require. For investors, however, Fisher believes that the dividend policy should be the least of their concerns. Now that Fisher has discussed when a stock should be bought, he now discusses when it should be sold. There can be good personal reasons for selling a stock (purchasing a home, financing a business etc. ), but Fisher focuses on the financial reasons for selling, of which he claims there are but three. First, an investor should sell if he has made a mistake. Unfortunately, it is difficult for the investor to admit a mistake to himself. Furthermore, the investor is often willing to sell a mistake at a small gain, but he is loathe to do so even for the smallest of losses. Illogical behaviour of this sort can cost the investor dearly, for small losses remove little from a portfolio which should gain hundreds of percent over many years, but they can prevent an investor from allocating his capital to the stocks which will perform best in the future. The second reason an investor should sell is if the company no longer exhibits the factors that made it a buy in the first place - namely, the fifteen items listed in Chapter 3. This can happen because management has become complacent, management has changed (and the new management no longer or is incapable of following the policies of the previous management), or the company is so large that it has run out of growth prospects. No matter how large the capital gain tax may be or how great the outlook for the company is, Fisher advises the investor to sell in such a circumstance. The final reason the investor should sell is if there is a better opportunity in which to invest. A company that will grow earnings 15% annually for several years is great, but pales in comparison to the potential returns from a company that will grow earnings 20% annually for several years, even after taking into account the capital gains tax. Fisher also warns investors not to sell simply because the price has advanced, or because it appears overvalued (when a company its growing earnings quickly, why pay the tax when its earnings will catch up to its premium in just a couple of years? ), or because a bear market is expected (as these are impossible to predict). Manhattan Bridge Capital (LOAN) provides bridge loans to small businesses needing short-term financing. This is a risky sounding business, particularly in a recessionary period. However, many elements of this situation make for an intriguing potential value investment. First of all, the company's loans are secured and short-term in nature. Usually, real-estate is used as security against the loans, and all payments are due within a year. Throughout every quarter of this downturn, business has (somewhat surprisingly) appeared to run smoothly, with full and timely collections resulting in a growing loan asset pool. Manhattan Bridge's capital structure is very safe as well, as the company carries minimal debt relative to its loan portfolio. Furthermore, the stock trades for half of its net current assets (with the loan portfolio classified as current due to the short-term nature of the loans). There are some other interesting items with respect to this stock as well. It is a ridiculously small company, even by the standards of this site! The company's market cap is just over $3 million, and the company had but 3 employees as of its last annual report. Also, as the company's share price has hovered below $1 for extended periods, it has received warnings from the Nasdaq, but so far it has remained compliant with the exchange's requirements. Whether the company's bridge loans will continue to perform is an open question. However, the market appears to be counting on the fact that half of these loans will fail, offering value investors a margin of safety with potential for price appreciation. In many ways, this company's price/value situation is very similar to that of Quest Capital, another potential value investment previously discussed on this site. The P/E ratio is one of the most useful metrics for determining how cheaply a company may be purchased. But as we've discussed before, it cannot simply be applied blindly; company earnings may be temporarily depressed, or may be high due to one-time gains. But even if earnings are corrected or smoothed to reflect fluctuations in the business cycle, a company's balance sheet position may be so exceptional that it also has a material effect on a company's would-be P/E. Clearly, the P/E ratio must be adjusted to become a meaningful figure. Furthermore, on its own it does not convey enough information to determine whether an issue warrants purchasing. The higher the P/E, the more earnings must grow to justify the price, and the more the stock price will fall if earnings growth does not come to fruition. This is why value investors prefer stocks with low P/E's, as low expectations lower the potential for loss of capital and raise the potential for price appreciation. 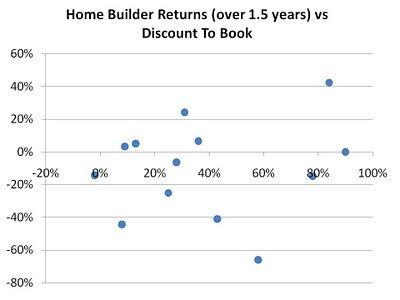 Higher discounts did not appear to translate into higher returns, suggesting that many of the discounts were indeed warranted. Normally, value investors would expect the stocks with the largest discounts to show the largest gains, so what happened here? What is likely missing here is how well these companies were capitalized. Discounts to book value tell you nothing about how indebted a company is relative to its assets. As a side note, it appears that the stocks with the largest discounts showed the most volatility in their returns (i.e. as you traverse the chart from left to right, returns of both a positive and negative nature are of higher magnitude). It is likely that some of these stocks showed a strong likelihood of going bankrupt, and so the ones that did lost big while the ones that narrowly escaped showed excellent returns as speculative plays. Forward Industries (FORD) makes carrying cases for a variety of products from cell phones to medical devices. The company has $20 million of cash and just $2 million of liabilities, yet it trades for just $15 million. Unlike other companies in this position, it is not burning cash, as it has managed to get the business to a more or less break even level. In addition, the company has a few million dollars worth of other current assets as well (in the form of A/R and inventory). Unfortunately, there are some elements which reduce this stock's appeal as a potential value investment. These elements all have to do with management's intentions. Usually, a company that hasn't made money in the last three years would serve as an acquisition target. In this case, however, management is intent on being an acquirer! The company has hired an investment bank to help it find potential targets, meaning management is itching to spend some of the cash it has on hand. Why might management not be interested in making a move that would increase share value (e.g. a special dividend, share buyback, or sale to another company)? One reason is the company's incentive scheme. Unfortunately, management's annual salaries represent several times their ownership stake in the company! As such, management is likely more interested in preserving their jobs and growing the company so that its reputation, status and salary continues to grow. Management also appears cognizant that a large number of shareholders are opposed to acquisitions and would prefer the cash to be paid out. This can be seen by the way management is trying to alter the corporation's articles to reduce the number of shareholder votes necessary in order to approve an acquisition (Voting Item #3)! Sometimes, a company can look like a value play, but management's incentives are not aligned with shareholders, and as such reducing the gap between price and value is not a priority. In such situations, investors may wish to steer clear or demand a larger margin of safety. When it comes to retailers, Wall Street has an obsession with same-store sales comparisons. Stocks will rise and fall by significant margins based on the monthly or quarterly changes in sales that a company reports. But the usefulness of such data varies by industry and by retailer. Same-store sales can indeed be a useful indicator of the health of a retail enterprise. Unfortunately, however, Wall Street appears to have exaggerated the importance of such data to a point where it now blindly appraises all retailers by their same-store sales data no matter what their individual circumstances may be. For example, just last week GameStop (GME) shares took a one-day haircut of 15% after announcing that same-store sales had fallen 8.6% (year over year) in the all-important December sales period. But same-store sales are a particularly weak indicator of performance for a company like GameStop, a retailer of video game products. Clearly, used game sales is where the company makes its money, even though they represent only a small part of overall sales! Walmart and Best Buy can cut new hardware and software prices to bring in traffic, but they have shown an unwillingness and an inability (respectively) to compete in used products, which is where GameStop has an advantage. Considering only same-store sales for this company overlooks the fact that it is growing where it is profitable, and simply matching prices in other areas in order to be a one-stop shop for the consumer. While same-store sales changes are an important indicator, they represent only the top-line. When making investment decisions, however, investors should be concerned with the bottom line and the returns on capital. There are many factors to be considered when it comes to auto insurance premiums. How, where and what kind of car are driven all come into play when insurance must be paid. A driving record is a determining factor when it comes to car insurance premiums. The better record you have, the lower the premium may be. As the years pass, the cost of the premium may decrease too. Factors included on a driving record include numbers of years driving, convictions associated with driving, accidents, speeding tickets, moving violations and license suspensions. The type of car driven can also affect auto premiums. Some vehicles have a risky status when it comes to how they fare in accidents and how safe they are. In addition, some cars have a high theft rate. Make and model matter as does replacing the vehicle if it is ever damaged. Knowledge is power and in this case, knowledge is money. The Canadian Loss Experience Rating (CLEAR) shows how much each car will cost to replace. The newer the model means the more out of pocket. The IBC (Insurance Bureau of Canada) website can show history of cars and the top cars stolen in Canada so you can know everything before you pay. Insurance premiums are based on more than what you drive and how clean your driving record is. The amount of time that you spend on the road is also a factor in how much the premium will be. If a driver spends a lot of time on the road, their premium will be higher. Insurance companies also look at all of the drivers that will be driving a particular car and their driving records too. If you live in an area with high vandalism and theft, the cost of an insurance premium can be quite high. In Canada, the provinces have categories that put insurance holders together according to their profiles. The amount of coverage chosen will also affect the cost. In addition, a low deductible carries a higher premium cost. Each province may also require its own minimal amount of coverage, so check for a motor insurance quote before committing to a plan. Furthermore, there are some factors that drive the premium cost and do not include anything to do with the driver. For example, inflation can cause premiums to increase and so can government regulation. Disclosure: The above is a sponsored post, and may not express the opinions of the site author(s). In this chapter, Fisher discusses tailoring one's investment strategy to one's individual financial situation. There should be no doubt, however, that Fisher recommends growth stocks for all types of investors. While one can make good money investing in "bargains" rather than growth stocks, the relatively small upside of 50% does not give investors the triple-digit returns he enjoys from some of his growth stock investments. Therefore, the decision the investor has to make has to do with the type of growth stock that should be bought. In this regard, Fisher comes up with two categories of growth companies. Those that are large and continue to grow (at the time of writing, these included stocks such as IBM, Dow and DuPont), and those that are as yet undiscovered by the institutional investors. Fisher notes that the undiscovered stocks have the most potential for excellent returns (on the order of thousands of percent), but at the same time he acknowledges that any one of them could turn out to be a dud and cost the investor his entire investment. Therefore, for those that have a stronger requirement to maintain their capital base, Fisher suggests the larger companies for their safety, and the fact that their upside should continue to be strong relative to the market. For those that can take more risks, Fisher advises a small-cap portfolio of the type of growth stocks that pass the tests of Chapter 3. Fisher also recommends that investors who do not have the time to go through the steps outlined in Chapter 3 use a money manager. However, it is still important for such investors to understand the issues involved, so that they may ask the right questions of their manager. Noting that there are many incompetent managers, Fisher discusses some important aspects in choosing a strong manager, including a good track record, a comparison of this track record to the market, and a discussion of the manager's investing philosophy. Karsan Value Funds (KVF) is a value-oriented fund, as described here. Though some readers have expressed an interest in investing, due to securities regulations the fund is not open to the public at this time. Should that change in the future, there will be an announcement on this site. For the fourth quarter ended December 31st, 2009, KVF earned 58 cents per share, bringing the value of each share to $11.40. Once again, the markets were strong, and therefore most funds and most types of funds will have made money in this period. The true test of whether this (or any other) fund is adding value will take place over a period of several years and through both bull and bear markets. Once again, weakness in the US dollar (relative to the Canadian dollar, the fund's reporting currency) hurt results. Had the exchange rate ended the quarter at the same position at which it started the quarter, earnings this quarter would have been 10 cents per share higher. Currency volatility is likely to continue to have a significant bearing on quarterly results, but over the long-term it is not expected to be a material factor. As the market rose over the quarter, some stocks were divested following their exceptional price run-ups. These stocks include ATV, MRD, CMI and GDL. Despite these divestments, KVF continues to own a great many stocks that are deemed to be undervalued. At the same time, KVF is also capitalized to seize any opportunities the market may offer through both temporary or prolonged pullbacks. These are exactly the kinds of companies that Philip Fisher would want to own. (Philip Fisher was Warren Buffett's mentor when it came to growth stocks.) So why don't these stocks appeal to value investors? Quite simply, because of the price. While the stellar returns on equity depicted in the chart above are clearly attractive, one must consider how much one has to pay for that equity. As we saw when we compared investments in Office Depot and Staples, adjusting returns for the price of the equity can have a dramatic effect on the attractiveness of a stock from an investor's perspective. Clearly, things have to go very right for these companies in the future to justify an investment at current price levels. While the companies are extraordinary and it is quite possible that they will continue to grow and innovate and thus reward shareholders even at these price levels, downside risks are also present. Unexpected negative occurrences could take a large bite out of stock prices when they are at such high levels. If future products are not as successful as past products, or if competition and new entrants are able to slow the growth of these companies, the stock prices will have to correct dramatically. On the other hand, there are plenty of companies with strong returns on equity (albeit not as strong as those of AAPL and RIMM), but which trade near their book values. As such, if things go wrong, the stocks don't have as far to fall. In many cases, the stocks even trade at levels such that the companies' assets offer investors protection from downside risks. This is the space in which the individual investor, who is not limited to companies of a certain size, should be playing. The importance of considering a company's debt repayment schedule cannot be overstated. As discussed here with a live example, debt due in 25 years does not represent the same danger to solvency as debt due in 1 year, though they both may be painted with the same brush ("long-term debt") on the balance sheet. However, a repayment schedule that does not require large payments for several years does not leave the company off the hook. The investor must be aware of issues that can accelerate repayment requirements, as such untimely accelerations are likely to come at a time when a company is already in a weak financial position. Consider TLC Vision (TLCV), a company we discussed two weeks ago due to its bankruptcy announcement. Last year at this time, it showed current debt of $8 million against current assets of $42 million. Just one quarter later, however, current debt skyrocketed to $89 million. The increase in current debt was not the result of a new loan, however, and so current assets did not increase, leaving the company in a rather precarious situation. The reason for the unceremonious and abrupt increase in the current debt level was due to the fact that the company was no longer meeting covenants in its long-term debt contract due to operational losses. As a result, what had previously been considered long-term debt (with a great part of the payments not due for several years) became due within the next year. Investors relying on the fact that certain debt payments were not due for several years were sorely disappointed. In the notes to the financial statements, companies break down their long-term debt due dates so that investors can estimate for themselves the company's ability to service its long-term obligations. Unfortunately, certain triggering events can result in the acceleration of certain payment requirements, and in some circumstances it can force the company into bankruptcy. Before delving into a full analysis, investors will often take a quick look at a company's balance sheet to get an idea of its financial position. Armed with information about the nature of the company's business, the investor can get a good idea of whether the company is "safe" from a solvency point of view. Since value investors value the protection of capital above all else, a company with a high debt level will often be immediately discarded from further analysis. Sometimes, however, a high debt load is not a threat to solvency at all! Consider Asta Funding (ASFI), a firm that purchases consumer receivables from companies that offer credit to their customers (e.g. credit card companies, telephone companies). For the quarter ended September 30th, the company shows consumer receivables of $208 million against senior debt of $123 million, for a difference of $85 million. Note that this is not the same thing as an asset of $85 million against no debt, because of the uncertainty of the value of the asset and the magnification of this uncertainty that results from leverage. To illustrate with an example, if the value of the asset is overestimated by 20%, the levered book value drops by almost 50% from $85 million to $43 million (208 * 0.8 - 123) whereas the value of the unlevered asset would only drop to $68 million ($85 million * 0.8). In the case of Asta, the value of the assets is rather uncertain. The company purchases its receivables for pennies on the dollar, as the companies selling the accounts have already tried and failed to collect from these customers. Adding to the uncertainty is the fact that high unemployment levels have made it more difficult for Asta to collect on its receivables: the company has written down $184 million of its receivables in the last four quarters. 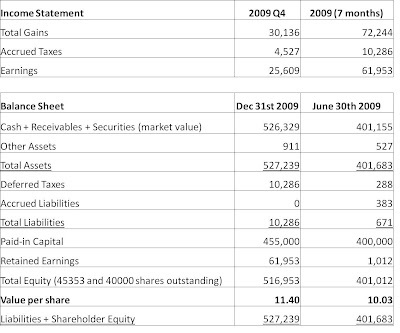 As such, an investor scanning only the balance sheet might take a look at these numbers and run. However, Asta is a lot safer than it looks. The reason for this comes down to the fact that most of its debt is secured by one particular asset, and only one particular asset. Should that asset (currently carried at $121 million) not perform, the loan of approximately $100 million does not have to be paid from the company's other assets! This is an interesting situation which increases the safety of Asta significantly. The company trades at just 2/3 of its book value despite the fact that most of the debt is non-recourse. Aaron Stackhouse discusses the company's situation in further detail here, for those interested in further analyzing this company. Looking at a company's balance sheet can give an investor a good idea of the company's debt level. However, only with a careful reading of the notes to the financial statements can an investor uncover items that significantly alter an investor's perception of how solvent a company may be. 13) Will substantial equity dilution be avoided to finance the business' growth? A company that meets the tests of the other 14 criteria is one that will be able to borrow money to fund growth. However, debt levels will at some point hit a maximum level, which is determined by the type of business carried out. Therefore, if a company is already at a high debt level, equity financing might be employed. The investor should determine the attractiveness of the company after carefully calculating the results of dilution of the company's stock. 14) Does management continue to speak freely to investors when disappointments occur? For even the best run companies, failures and disappointments occur. The firms showing the greatest gains are those which are always developing new products. Inevitably, some of these will not turn out as well as expected. How management reacts is what's important for the shareholder. If management "clams up" because it does not have a plan, or if management panics, the investor should exclude the company from investment. 15) Does management have unquestionable integrity? Managements are always in a position such that they may enrich themselves at the expense of shareholders. They are closer to the assets than shareholders, and as a result are granted leeway that can be legally abused in an almost infinite number of ways. For example, they can put relatives on the payroll and pay them salaries above market value. Furthermore, they can lease assets to the corporation at above-market prices. Investors must confine investments to companies where managements are of the highest integrity. Fisher recommends the "scuttlebutt" technique (discussed in Chapter 2) for confirming that management has the necessary integrity.